Vitamin C is one of the most important nutrients and according to some experts, you may want to obtain higher doses of it for specific conditions or for optimal health. Do it easily and economically with Fharmonat Vit. C 1000mg. Fharmonat Vit. 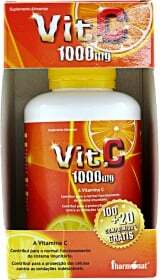 C 1000mg also provides you with effective levels of Zinc and Vitamin B6 which will support reproductive health, increase energy production, and promote excellent brain function. For stronger immune defense and powerful antioxidant support, take Fharmonat Vit. C 1000mg. Have a question about Vit. C 1000mg? What is it, what does it do, how and when to use or something else? Ask us. Other Ingredients: Corn starch, microcrystalline cellulose, silicon dioxide, magnesium stearate. WARNINGS Vit. C 1000mg : Do not exceed recommended daily dosage! Food supplements should not be used as a substitute for a varied and balanced diet and healthy lifestyle. Keep out of reach of children. Do not use if you are allergic to any ingredient in this product. Store in a cool dry place away from excessive heat, moisture, or sunlight, below 25º C.